Alliance Air Freight is a full service freight company offering LTL truck, Full Truckload, Rail, domestic & international air freight and ocean freight services. 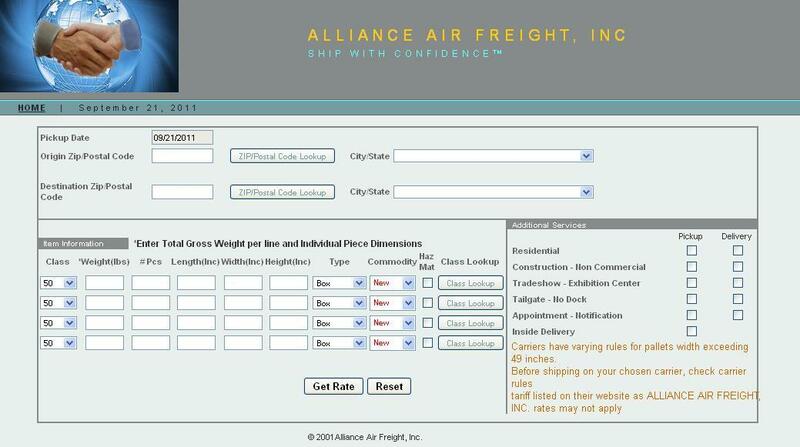 Alliance Air Freight specializes in heavyweight shipping for commercial, manufacturing, industrial and eBay customers. Routinely their customers rave about their ability in providing timely proof of freight deliveries along with their low freight rates. SolverCircle has developed their online freight rate system. You can have a screen shot below.